Roll With Me had it’s World Premiere at the 18th Annual Woodstock Film Festival while also winning the prestigious Carpe Diem Award at the Maverick Awards. Ava DuVernay’s distribution company ARRAY has announced that they have acquired the United States, Canada, United Kingdom, Australia, and New Zealand rights to the Lisa France documentary ROLL WITH ME. The film will premiere December 1 on Netflix and will be accompanied by a national screening tour to coincide with the International Day of Persons with Disabilities which is recognized on December 3. An official selection of the 19th Annual Woodstock Film Festival where it made it’s New York Premiere, Swimming With Men will be released through IFC Films on VOD and in the United States on December 7. THE FULL MONTY in Speedos! When an accountant, played by multi-talented comedian Rob Brydon, seeks to win back his wife, he stumbles upon a surprising solution in the form of a male synchronized swimming team: Men Who Swim. Eric (Brydon) believes he can win back his wife Heather (Horrocks) by diving into the world of male synchronized swimming. Joining his local team, Eric finds a surprising brotherhood in this motley crew as they train for the world championships in Milan. The Independent Spirit Awards nominees were just announced, and so many of Woodstock Film Festival’s films, friends and alums have been nominated! Huge congratulations and good luck to all nominees! Socrates, had it's East Coast Premiere at the 19th Annual Woodstock Film Festival. The film, winner of the Ultra Indie Award at the 19th Annual Woodstock Film Festival has been nominated for three awards. Director Alex Moratto has been nominated for the Someone To Watch Award and the John Cassavetes Award, and Christian Malheiros has been nominated for Best Male Lead. Congratulations to the whole team! Guest Programmer Roger Ross Williams brought Hale County This Morning, This Evening to the 19th Annual Woodstock Film Festival. This powerful documentary was nominated for two Independent Spirit Awards including Best Documentary and Truer Than Fiction Award. Congratulations RaMell Ross for winning Best Documentary at the Gotham Awards! Wildlife, the centerpiece film of the 19th Annual Woodstock Film Festival, courtesy of IFC Films, was nominated for three Independent Spirit Awards. Paul Dano is nominated for Best First Feature, Carey Mulligan for Best Female Lead, and Diego Garcia for Best Cinematography. Congratulations to the team! Earlier in the year we held a special screening of Debra Granik’s new film Leave No Trace. Granik has been to the Woodstock Film Festival in the past with her films STRAY DOG and DOWN TO THE BONE. This year Leave No Trace has been nominated for four Independent Spirit Awards: Bonnie Award, Best Feature, Best Director, and Thomasin Harcourt McKenzie for Best Supporting Female. Congratulations Debra and Thomasin! This intensive writing workshop will teach you how to mine the movie, television series, novel or novella in your mind. In four distinct sessions, we will collaboratively work to draw your idea forth– å la Zeus– inducing the full-grown Athena from your brain– moving it from concept to conception. Most class time will be spent in workshop mode– you can learn as much about your idea brainstorming someone else’s project as you can when being workshopped. One-on-one meetings will also have their place. Topics such as Three-Act Structure, Plot vs. Premise, Plant & Payoff, and Discovery & Reversal will be covered. Alex Smith is a screenwriter, filmmaker and educator who hails from Montana. He and his twin brother Andrew premiered their latest feature film, WALKING OUT, at the 2017 Sundance Film Festival. WALKING OUT stars Golden Globe winner Matt Bomer, Josh Wiggins, Bill Pullman, and Lily Gladstone. The film was distributed by IFC Films. This #GivingTuesday please think about the Woodstock Film Festival. To celebrate our 20TH ANNIVERSARY in style, the Woodstock Film Festival is seeking funds to finish film center renovations. Your contribution will make an impact, whether you donate $5 or $5,000. Every little bit helps. 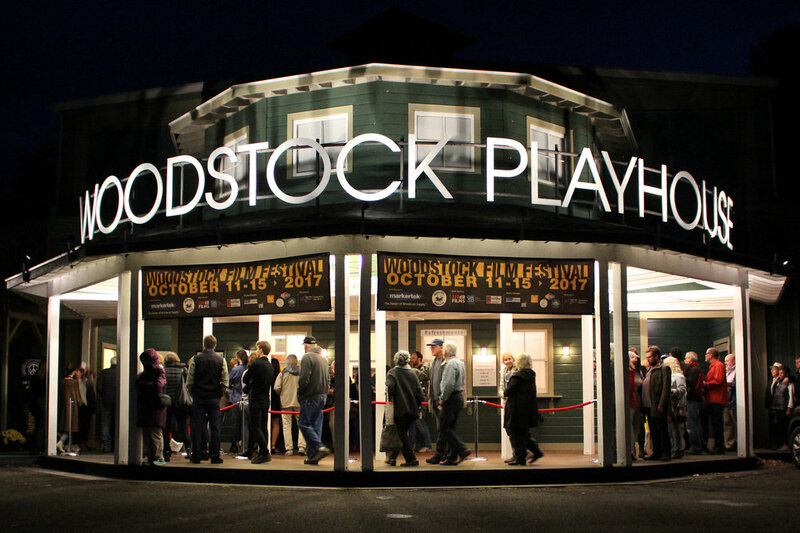 The Woodstock Film Festival is a not-for-profit, 501 (C)(3) organization with a mission to present an annual program and year-round schedule of film, music, and art-related activities that promote artists, culture, inspired learning, and diversity. As we celebrated Thanksgiving last week with family and friends, the Woodstock Film Festival would like to give thanks to all those who make the festival possible year after year. The wonderful staff, interns, volunteers, gracious hosts, our incredible sponsors, all the supporters, participating filmmakers and industry members, and the audiences who attend from near and far. Thank you for being a part of the Woodstock Film Festival. We couldn’t do it without you.